This is a chutney used as a side dish with rice. Salt to taste(only if necessary, as the mango is already salted). Cut the mangoes to small pieces. Grind with coconut, chillies and 1/2tsp of mustard to a fine paste. Add sufficient water to grind to make it to the required consistency. Season with the remaining mustard and curry leaves in coconut oil. This is a side dish, in which the root vegetables are fried and used in the preparation of a side dish. Suran(yam) and kaachil(a root vegetable similar to suran) are used for this preparation. They are de-skinned, cleaned, sliced and deep fried and added to the gravy. Deep fry the suran/kaachil pieces to a crisp texture. Prepare the masala by grinding coconut, chillies and turmeric to a smooth texture. Boil the masala for 5 mts in a flat-bottomed vessel, after adding salt, sol and sufficient water to make the gravy. Add dal and boil for another 2 mts. Remove from flame and add the fried suran/kaachil pieces and mix. Season with mustard seeds, methi seeds, urad dal and curry leaves in little oil. Mix well. The curry is ready. Bikkand Ani Nonche Ambya Humman(Jackfruit Seed & salted Mango Curry). Jackfruit seeds are available in plenty during summer.A simple preparation using this is given below. Cut the mango into pieces. Remove the white outer skin of the seeds and soak them in water for 2hrs. Then using a knife, scrap off the brown skin. Cut the seeds into small pieces. Once it flutters, add the chilly flakes and the cut seeds. Add sufficient water and salt and cook on a meduim flame till the seeds are well cooked. Add the mango pieces and cook for another 2 mits. Remove from flame and the curry is ready. Th curry is of semi gravy texture. Banana stem has many medicinal values.It provides the requisite fibre and aids digestion, helps dissolve stones in kidneys etc. It can be used raw or cooked. Raita using raw stem(see prabhaskitchen recipe list) is very tasty. Given below is a side dish with cooked stem. The stem has to be de-threaded, before use. Cut the stem into slices. While cutting, roll the thread that appears by rolling them on the left hand fingers. After removing the threads, cut the slices into small pieces. These pieces are ready for cooking. Cook the dal in a presure cooker to a soft texture. In a pan, cook the stem pieces, using a cup of water, for 5 mts. 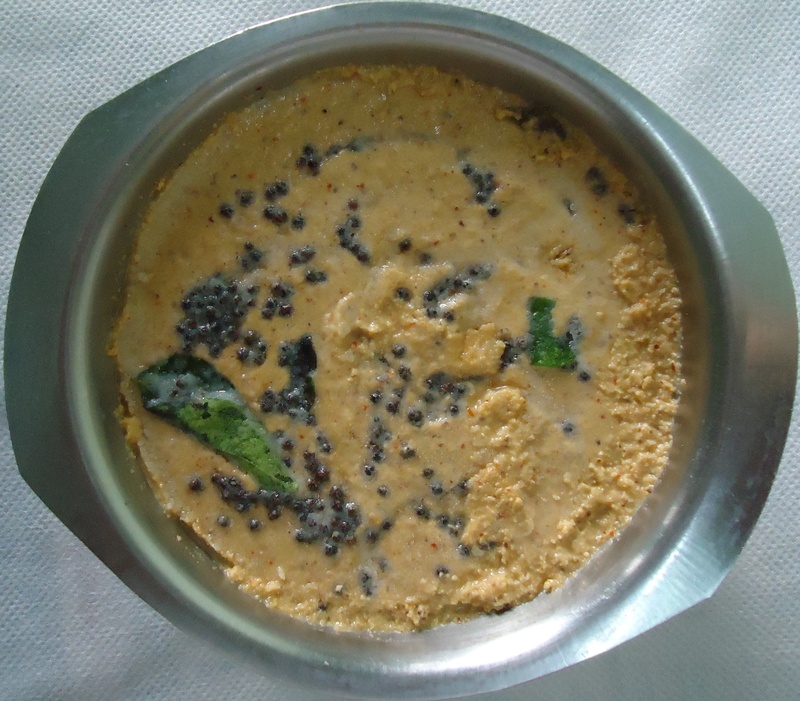 Grind masala with coconut, red chillies and turmeric powder and make a smooth paste. Add salt, sol and the masala to the cooked stem and boil for 5mts. Add the dal and if necessary, add little water to bring it to the required consistency. Just cook for another minute and remove from flame. Season with mustard, urid dal and curry leaves in oil. Whenever fresh mangoes are not available during the off-season,the preserved salted mangoes become handy to prepare a quick spicy side dish to be served with rice, pej(rice kanji), chappatis,etc. Cut the mangoes into small pieces. In a pan, heat oil, add mustard and after it splutters, add the urid dal and methi fry a little. Add chilly powder, turmeric powder, hing, cut mangoes, curry leaves and little water. 1.Additional water can be added to get the required consistency. 2.One tsp of coconut oil can be added as per choice. 3.Normally, additional salt may not be required as the mangoes are already seasoned with enough salt. If found necessary, a bit of salt can be added to get the required individual taste. This chutney is very tasty and goes well with rice, dosa, chappatis etc. salt(only if it is essentially required-must be very cautious on this ). Grind coconut, mango(cut into pieces) and chillies together to a fine paste. Season with mustard, hing and curry leaves in oil. The chana is to be soaked in water for at least 6 hrs before cooking. Pressure cook the soaked chana. After the 1st whistle, bring the flame to low and cook for another 20 mts. Decant the water from the cooked chana, which is used in the preparation of the above dish and the chana is used for preparing the dry curry(Chonya Upkeri-see recipe list). The above water content is used by the Konkani community for preparing a side dish. In Konkani parlance, it is called Chonya Udhaak. It can be consumed only with rice, as it is watery in texture and does not contain any solid content. But it is very tasty. It is used in place of Dal/Dali Thoy, whenever the bengal gram preparations are made in the house. Boil the chana water with salt in a vessel . In a pan, heat oil, add mustard seeds. When it splutters, add the curry leaves and bring the flame to low. Add all the other condiments and finally add the chana water. The dish is ready and can be served after 5 mts.